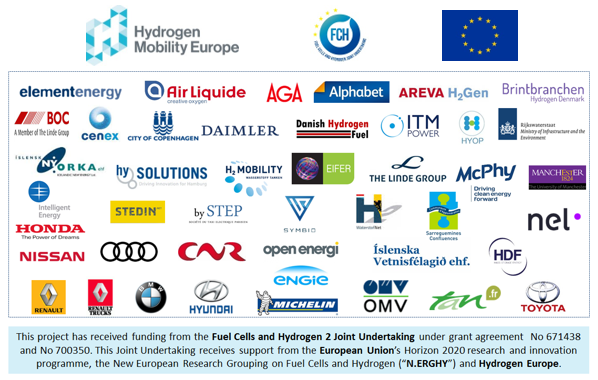 The Hydrogen Mobility Europe (H2ME) project was launched in 2016. This initiative will lead to the deployment and operation of over 1,400 fuel cell vehicles and 45 hydrogen refuelling stations across Europe. Building on the national strategies developed previously, the H2ME project involves more than 40 partnering organisations from 9 countries, drawing together their expertise from across the transport, hydrogen and energy industries. Having led the conception and application for the two phases €67m of European funding for this €170m project, Element Energy is now coordinating the six year delivery phase, alongside the H2ME project. This is the latest in a series of related activities that seek to demonstrate the ability of hydrogen fuel cell technologies to solve transport challenges and to transition the sector to a fully commercial phase from the 2020s. Vehicle-to-grid (V2G) technologies are expected to play a key role in the decarbonisation of Britain’s transport and energy systems. Connecting millions of EVs and coordinating their charging and discharging would minimise the costs of EV charging while allowing the grid to integrate high levels of variable renewable energy sources. The Vehicles to Grid Britain (V2GB) project will assess the long-term viability of V2G in a changing energy system in Britain as well as the early opportunities in British energy markets using the consortium’s expertise drawn from a variety of key project partners and access to operational data on EV charging. Pathways for scaling up a V2G business to play a full role in a flexible energy system in Britain will be explored. Element Energy is leading this strong consortium of stakeholders from the transport and energy sectors, representing the complete value chain of V2G technologies. Nissan’s European Technical Centre, as part of Renault-Nissan Alliance research activities, and distribution network operator Western Power Distribution have been at the forefront of research and development exploring the potential benefits of EVs to electricity networks. Transmission system operator National Grid is recognised as one of the most innovative grid operators facing the challenge of integrating intermittent renewable energy into an islanded electricity grid, whilst aggregator Moixa has developed innovative software solutions to combine multitudes of batteries to a virtual power plant (VPP), which is able to support the stability of the power grid. Consultancy Cenex and the Energy Systems Catapult, a leading technology and innovation centre set up by the government to help the UK navigate the transformation of our energy system, will support the study with their analytical modelling. The V2GB feasibility study is part of the Vehicle-to-Grid competition, funded by the Office for Low Emission Vehicles (OLEV) and the Department for Business Energy and Industrial Strategy (BEIS), in partnership with Innovate UK. The V2G projects represent a significant step towards the transition to a low carbon transportation and a smart energy system. Allowing EVs to return energy to the electricity networks when parked and plugged for charging will increase network resilience, allow for better exploitation of renewable sources and lower the cost of ownership for EV owners, leading to new business opportunities and clear advantages for EV users and energy consumers. Element Energy assembled the consortia of these two projects and now leads the technical management of the implementation phases. The projects will install 900 (ene.field) and 2,500 (PACE) fuel cell microCHP units across Europe. Element Energy wrote the successful bid proposals and is the technical coordinator for the projects. This collaborative project involved 26 partners such as public authorities, leading research institutions and industry partners seeking to deploy over 900 fuel cell CHP units across Europe. The project was the first large EU initiative for deployment and support of FC mCHP and allowed the preparation of the next stage in commercialising fuel cell CHP for each of the project partners and has been a major component of the activities to support for fuel cell CHPs in Europe. PACE brings together the four leading European FC CHP suppliers (Bosch, SOLIDpower, BDR Therma and Viessmann) in a project to deploy 2,500 next-generation mCHP units in customer homes and small enterprises. This is a step change in the level of deployment of FC CHP in Europe and will be a major step towards the industrialisation of the technology, following activities undertaken as part of ene.field. The research leading to these results has received funding from the European Union´s 7th Framework Programme (FP7/2007-2013) for the Fuel Cells and Hydrogen Joint Undertaking Technology Initiative under Grant Agreement Number 303462 and from the European Union’s Horizon 2020 research and innovation programme and Hydrogen Europe and Hydrogen Research under grant agreement No 700339.